Painful Stress Fractures in the Feet Watch this short video to learn about stress fractures in the feet and what they are caused from. If you’re anything like Dr. Evan Merrill, then you’re hitting the roads and trails a few times a week for a run. The excitement, exhilaration, and thrill of feeling the fresh air on your face, in your lungs, and blowing through your hair is enough to make athletes fall in love with running. The problem is, running can take a toll on your body. Over time, the pounding of the pavement can turn from joyous to painful. For an athlete, there’s nothing worse than being taken from the activity you love because of an injury. By being cognizant of the most common injuries runners face, you have a better chance at preventing them or stopping them before they worsen. Achilles Tendonitis - If you over train or break into running too quickly, you’re more at risk of developing Achilles tendonitis. Be careful if you notice that the back of your heel and ankle is hard to move, painful, or stiff. If you have any of these symptoms, take a rest day or two. Stress Fractures - Stress fractures are painful, yet quiet injuries. Unlike a break from trauma, you won’t know the exact moment they happen. If you have any kind of pain, see your podiatrist to be sure you don’t have a stress fracture. Ankle Sprains - Rolling an ankle on a rock or curb is common. If your ankle becomes swollen, bruised, or sore, rest, ice your ankle, and elevate it to help it heal. Blisters - Blisters occur from poorly fitted shoes and too much friction. If you start to develop blisters, change your shoes. You should also wear a protective bandage to avoid your blister from worsening, which could cause an infection. Plantar Fasciitis - This is the inflammation of the bottom of your foot. If your feet are sore and swollen after a run, rest, ice, and elevate them so that your tendon can heal. 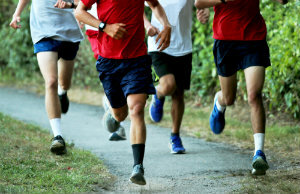 Shin Splints - Medically known as "tibial stress syndrome," this is a fairly common condition. Pain is the major symptom and it typically develops along the tibia - the larger of the two lower leg bones. When you’ve been injured on the road, talk to someone who knows what it’s like to be a runner. Dr. Evan Merrill is not just a podiatrist—he’s also an athlete. He understands the torment you feel when you have to rest from an injury. That’s why he encourages you to catch these injuries before they happen so that your rest time is as minimal as possible. Do you ever see Dr. Evan Merrill out at an event, such as the Pearblossom Festival or any other race? If so, be sure to say hi! ?How are toe injuries treated? ?How are stress fractures different from normal fractures? ?What is the best way to start running?